We design and build eye-catching, responsive websites that work as a natural extension of the business. Every website we design is search engine optimised as part of the website design package. They are also properly integrated into the company's social media presence, creating a seamless online experience. Visitors want different things, in different ways, at different times. Does your online presence allow your users to get what they want, the way they want it and when they want it? Bespoke website designs are custom built to reflect the business offering and its brand identity. Our websites adapt to suit the business needs. Do you want an information website that can grow into an eCommerce one? We will build it with that in mind and reduce future development costs. Responsive website designs are more than just mobile friendly. They respond to how the visitor is viewing the site to give the best experience possible. A happy visitor is more likely to become a customer. 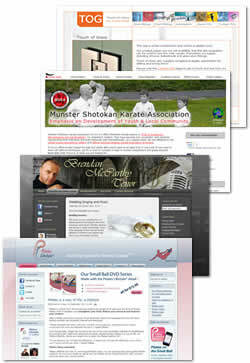 Converting existing websites to content management websites. CMS websites can be updated easily by the owner - even their eCommerce platforms. Social Media integration puts your company in the pockets of potential customers 24/7 at their request. Free, direct advertising! Interactive website design is more than pretty pictures. It is a balancing act between website graphics, user interface design, functionality and relevant content. A website is an extension of a company's brand and its ethos. It should reflect and enhance this to create a strong brand identity. 'stickiness' on a site is crucial for improved user conversion rates. If a website is not found by search engines, what use is it? More than a million websites go live everyday! Proper search engine optimisation prevents the 'needle in the haystack' syndrome. Find out more about our Search Engine Optimisation Service and the package options. Why responsive? Responsive design allows the visitor to access your website in the way they want, when they want. Visitors will have a great experience from a computer, tablet or mobile phone. We create mobile and tablet friendly / responsive websites. The website responds to the device being used to view it. It properly fits the screen and all the information is easy to read. No more pinch-to-zoom. Smart phones now outsell normal mobile phones. This is great news, as it means that company websites have the potential of being in the user's hands 24/7. More on responsive design here.